Which president holds the record for the most vetoes? Which president had the largest shoe size? Who was the only president to serve in both World War I and World War II? Who was the tallest president? These questions and many, many more are answered in The Smithsonian Book of Presidential Trivia, which has been fully updated to 2017 to include trivia question and answers about every US president to date. 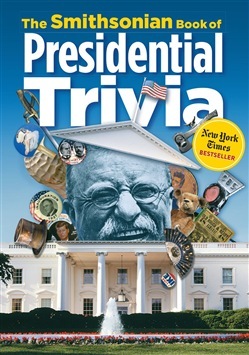 Divided into 11 chapters, The Smithsonian Book of Presidential Trivia looks at every aspect of our heads of state and presidential history: Citizens, Officers, Heroes, and Saviors; Stumping: From Front Porch to Facebook; The Pledge and the Parties; Inside the Oval Office; The Perpetual Podium; Home, Hotel, Parlor, Playground; First Families; Impeachment, Controversy, Shame; Assassination; Death, and National Mourning; Presidents in the Popular Imagination; and The Quotable President. Many of the questions are accompanied with photographs of artifacts from the Smithsonian's collections. The Smithsonian Book of Presidential Trivia is sure to puzzle the trivia buff and presidential expert alike! Acquista The Smithsonian Book of Presidential Trivia in Epub: dopo aver letto l’ebook The Smithsonian Book of Presidential Trivia di Smithsonian Institution ti invitiamo a lasciarci una Recensione qui sotto: sarà utile agli utenti che non abbiano ancora letto questo libro e che vogliano avere delle opinioni altrui. L’opinione su di un libro è molto soggettiva e per questo leggere eventuali recensioni negative non ci dovrà frenare dall’acquisto, anzi dovrà spingerci ad acquistare il libro in fretta per poter dire la nostra ed eventualmente smentire quanto commentato da altri, contribuendo ad arricchire più possibile i commenti e dare sempre più spunti di confronto al pubblico online.